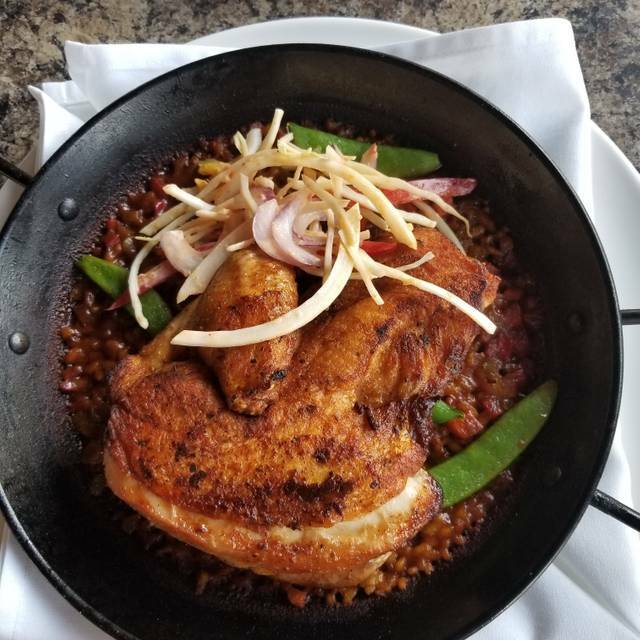 At Havana 59 West our goal is to take you back to the traditional indulgence of the island city when it was considered "The Paris of the Caribbean" in the 1950's. Our continuing goal is to provide you with a unique dining atmosphere and an unforgettable experience. We utilize fresh fruit juices, many squeezed right here at Havana 59 West. Our entrees are made with imported fresh fish, quality Harris Ranch Natural Beef and local farm fresh vegetables. Come enjoy our home made mojitos or one of our specialty cocktails paired with our daily made entrees. We look forward to seeing you! We had calimari for apartizer, seafood paella as the main dish, and tres leche & flan for dessert. All was excellent. The draft beer we thought were over priced and both the white and red sangria tasted like water. Waiter was polite, but there were only two to tend both floors as well as the bar. We were party of four and did not like that a 20% tip was added automatically. Food was delivered in an appropriate time, but the place was not crowded at all. We arrived at 6:15pm. Great experience! We actually had a couple more people show up than we had reserved for, but the staff was able to easily accommodate us. The food is always amazing, the staff did a great job, and everyone was happy! The music was a little loud since we were right under the speaker, but that's really a minor gripe. Always amazing food and we loved getting to share this somewhat hidden gem with friends! Made reservations to celebrate a birthday and it was our group’s first time. They seemed understaffed and in the weeds. We had to wait quite a while for every course. We ordered a cucumber cocktail and the manager advised the cucumbers were bad so he offered to comp mojitos for us that we later determined we still paid for. This is our fault, I guess, for not meticulously checking the bill a few drinks in. The waitress didn’t tell us gratuity was included (in her defense, it was noted in the menu) so after subpar service the entire evening, she made off with a 35-40% tip. My sister brought this to her attention and she offered to give the cash tips back, but everyone got uncomfortable and awkwardly let it go. I gave 2 stars overall simply for the egg rolls which far upstaged the entree that took forever to follow and for the waitress and manager being “nice.” Still, most of our evening involved spending hundreds of dollars to wait and be disappointed. They did nothing to acknowledge my sister’s birthday. In a nutshell, Havana 59 was nothing to write home about, and we likely will not return. Havana 59 was a very nice restaurant. After we ate dinner around 8 pm we went upstairs to learn Salsa dancing. The instructor was good at teaching. Very fun experience!! Will be going back!! 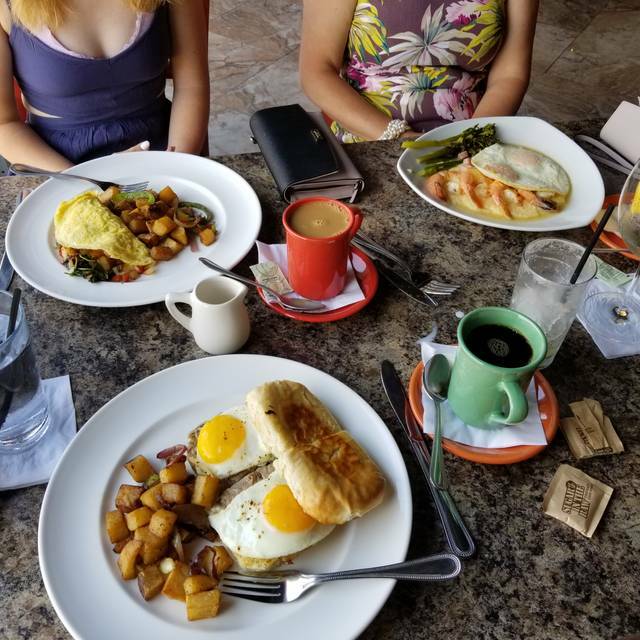 First time visit to Havana 59 West was a wonderful experience! This hidden gem is worth a visit. Our reservation was for 6:30 p.m., but we arrived about 30 mins. early. We were seated immediately. Our server, Taylor, was attentive and helpful when she found out it was our first visit. My husband visited the downtown site several years ago and prefers this new location. It has a cozy cafe vibe. Our appetizers were the empanadas and cups of black bean soup. Both were flavorful and delicious, perfect for a chilly night! The entrees were fantastic! My husband ordered the 24/1 serving paella. My entree was the Cubano. I really enjoyed the black beans with the fresh cilantro. We don't usually order dessert, but decided to get the banana rum caramel toffee cheesecake off of the Valentine's Day menu. Thank you Taylor for making that happen! It was really, really wonderful! Our favorite part of the evening was watching the staff. Everyone pitched-in to bus tables, carrying orders to tables and checking on customers. The restaurant has a small staff, but everyone worked together to make it appear effortless. Thanks for a wonderful evening! We plan to return soon! Very disappointed, made reservation for lobster and steak and they didn't have it. My wife loves lobster, the whole reason I made reservations there. Good food and service, excellent portion size, reasonable prices for the meal. Have visited the restaurant several times, always a good experience and a pleasant date night. Terrible service. We had a reservation and were there over an hour before even getting drinks. We had another hour before we had to be somewhere and told our waitress that after it took so long to get the drinks. Still got our food 50 min later and the chicken was raw in the middle. This was our first time to the west location. We have been going to shockoe for years. The atmosphere is not the same. Food and service were great, but we will stick to downtown from now on! Love the gritty atmosphere! We had friends coming down from NY and they love to try new food. When we go to NY or they come here we always go out to eat. We couldn’t wait to bring them here. They had the pork chops and lamb and we split paella 59. Everyone’s meal was delicious! We all shared desert. Our friends raved about their meal. On top of that, we found out there was a cigar bar upstairs and also had salsa lessons going on! Overall the Cuban specialties were tasteless, except the lechón asado which was nicely seasoned. The Cuban nachos were different (made with fried plantain strips instead of corn chips), but tasty. 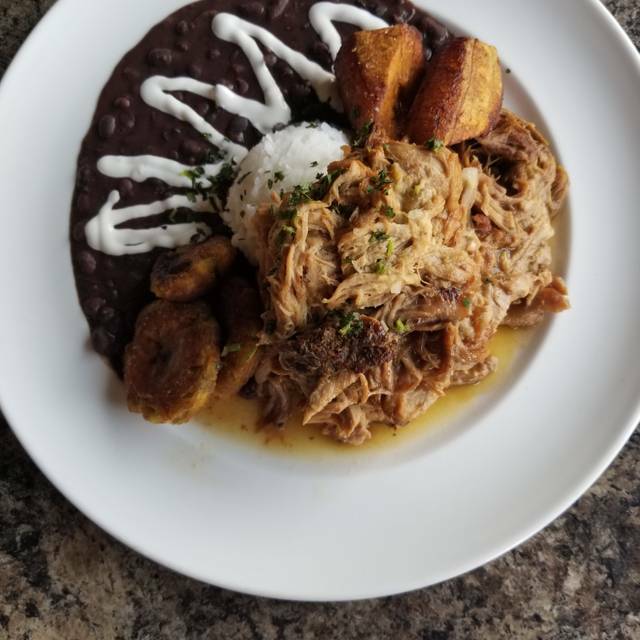 The Ropa Vieja, the Empanadas and the black beans were flat. This was our second visit and it was a big disappointment. We think we will not be returning. Went here for New years eve dinner with a group of 10. Very nice that they already had our table set for us. This is a classy place without feeling stuffy or like you need to be in full formal wear. If you want to dress up and have a nice date, with fun ambiance, I highly recommend. Mojitos were to die for! Great for groups, as they even had playing cards on the table. The only thing it lacked was music. While I get that the whole restaurant was filled that night, no one could hear any good latin music (it was playing but at an extremely low volume)..in a place like this you expect there to be good music to go with the awesome ambiance. At one point when the group started to "feel the alcohol" we ended up playing music off of our phone, just to have something to ~vibe~ too. Great food, great service, quiet atmosphere, and delicious mojitos! Pricy but worth it. A nice fun place for some Cuban cuisine. Wonderful service. Indoor downstairs can be a bit noisy for people who have issues with background. This was our first visit to the West End location. Food and service were excellent! I think we were there on an uncharacteristically quiet night. They are usually hopping! Will be going back! Always a great evening of food and music. The food is incredible and the Mojitos are Fantastic. I know that it's Cuban inspired regarding meat. As the only vegan in my group, it was nice to see a vegan entree. The Cassoulet was very tasty. The home made hot sauce was a little pricy, but delicious. Maybe next time, more vegan alternatives! It is great having a stylish, fun, tasty, locally owned and operated, theme restaurant in the far west end. The food and drink are excellent. The service and ambiance are great. Be prepared to spend more than at a chain. The food was good but the portions were very small for the price. We ordered the paella for 2 and asked the waiter if there would be enough for 3 ladies. He said no way and told us to order 2 appetizers as well. We did what he said and then couldn’t finish the paella! Really good experience will come back. Nice atmosphere and comfortable setting. 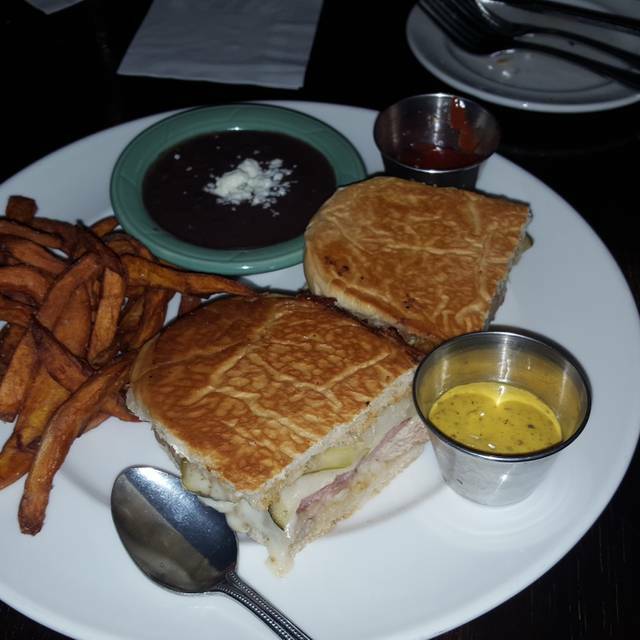 Good food and service, authentic Cuban cuisine, enjoyable experience dining outside. 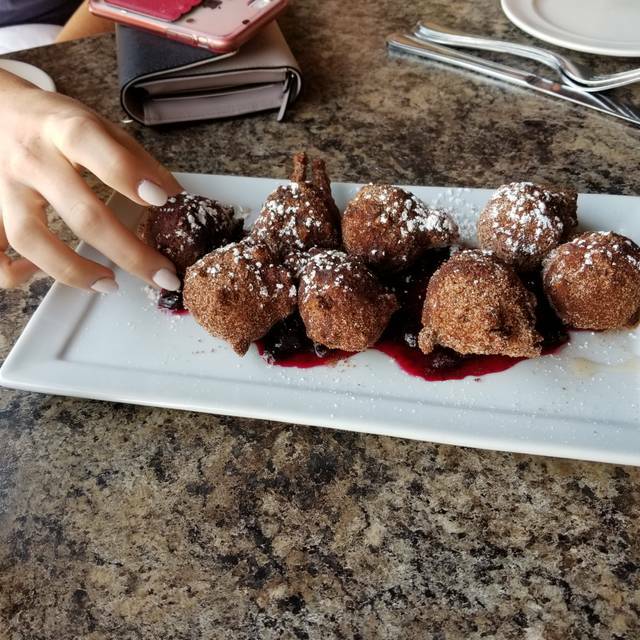 This was our first visit and I said to my husband , “this is my new favorite place.” The service was great , very friendly and the food was wonderful. I had the Ropa Vieja and my husband the 59 Paella, appetizer was Cuban Nachos, very different and so good with a few Mojito’s to top it off. We enjoyed our experience. My husband prefers the downtown location for it’s atmosphere much better. However, great service and awesome bartender! Great service. I had Mofongo which was outstanding. Wife had paella which was spicy but great. No dessert vecause we enjoyed the entree too much. We will be back. Food was delicious and we had a party of eight and really enjoyed the atmosphere and the service was great. Excellent...good food and great value - highly recommend. Great food and service. 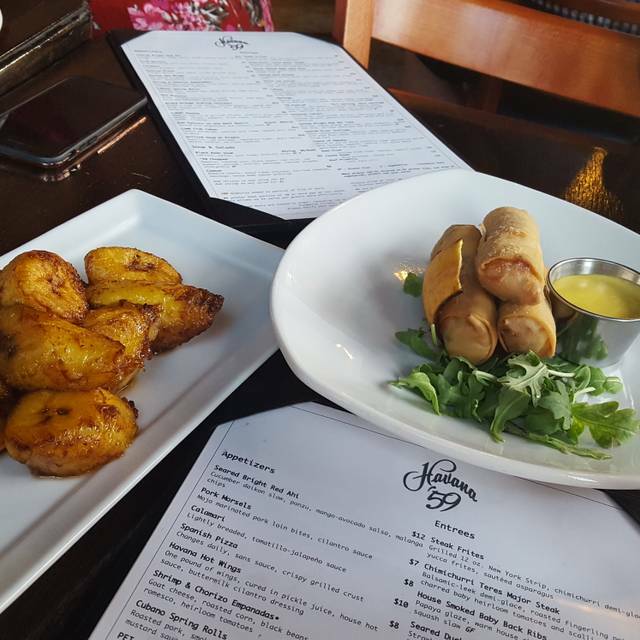 We regularly dine at downtown Havana 59 so we were hesitant to try the west end version of the restaurant. While it doesn’t have the ambiance of downtown, it had everything else. We will definitely be back to experience the upstairs dining area. Great food and good selection of unique mixed drinks and local brews. We thoroughly enjoyed everything! We used the happy-hour appetizer specials to make our own yummy tapas dinner. 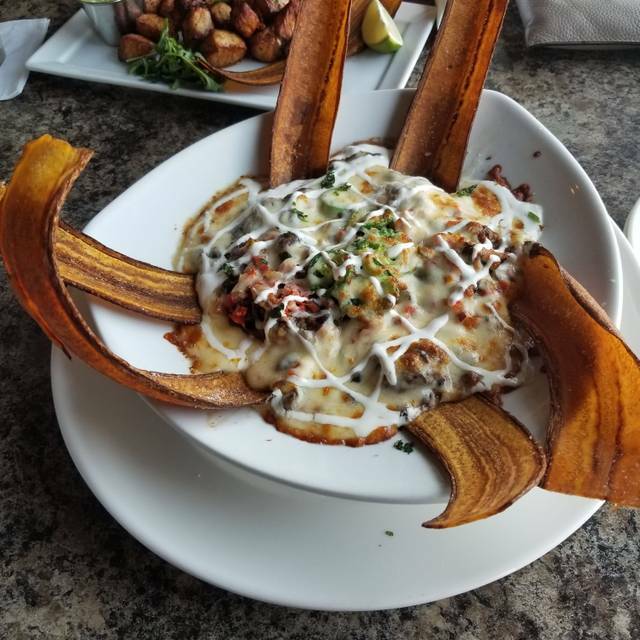 Every time we go, we find a new favorite dish, so it gets harder to choose what to order with each visit! First time eating here, it was recommended as a good Cuban restaurant. The mark of a ‘good’ restaurant is one that can 1-off the menu. For example, I ordered the Ropa Vieja. It’s normally made with beef. I asked the server for the same meal except made with shrimp. I’m thinking, stir some shrimp up in there with the peppers, tomato and onions (same as the beef) and we’re good to go. Nope, I was served six grilled shrimps, with rice and beans… When I asked requested the peppers, tomato and onions (an integral part of Ropa Vieja), I was told it would be an extra $2.00 (REALLY, for something that is SUPPOSED to come with the meal??). Not one to cause a scene I said ok, fine, $2.00. What did the server bring out? A plate of grilled peppers… not a tomato or onion in sight. So yeah, I won’t be going back. BTW a friend ordered the Ropa Vieja as advertised… it was dry and tasteless, so it wasn’t just me.